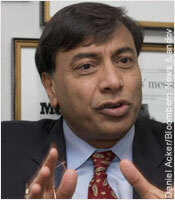 Lakshmi Mittal is meeting French ministers amid concerns about his firm's 18.6bn euro (£12.7bn) bid approach for rival steelmaker Arcelor. Luxembourg-based Arcelor rejected Mittal Steel's bid over the weekend, labelling it a "bit ridiculous" and saying it was braced for a tough fight. Mittal, owned by British-based tycoon Lakshmi Mittal, has raised concerns in France, Belgium and Luxembourg, where it is a major employer. Finance minister Thierry Breton said the French government had the "greatest reservations" about the bid. It has expressed fears that a deal may hurt Arcelor's 28,500 French staff. Both firms are trying to put their case across in Paris as the furore sparked by Mittal Steel's surprise bid continues to grow. Although Arcelor is not a French company, its shares are listed in Paris and it has a large French workforce. Mittal Steel's proposed deal would create an industry giant, accounting for about 10% of the world's total steel output. Industry experts said neither company would want to give an inch in the ensuing battle. In a “twist” on a previous story, Mittal has apparently reached agreement with Thyssen Krupp to sell Dofasco (TK recently lost out in a bidding war for Dofasco with Arcelor), if they succeed in acquiring Arcelor! Mittal is currently the largest steelmaker in the world, but not a “major player” in steel strip production. If they were to successfully acquire Arcelor that would change as they would become the largest strip producer in Europe.